The beginning of the formation of stars is still somewhat of a mystery, especially for stars which are several times more massive than our Sun, or for large clusters of stars. How do such large stars assemble themselves, individually and in clusters? A simple theory would predict massive clusters could not be as tightly packed as we see. Do massive stars drive off their nascent gas in the same way as low-mass stars? Do they have similar, or any, solar systems? The mysteries of massive star formation are important since these stars, while few in number, are a major part of the engine driving the Galactic ecology. 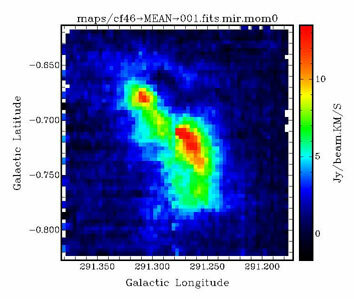 Using the Mopra dish of the Australia Telescope, CHaMP is collecting a large database of properties of medium- and high-mass star formation throughout the Milky Way by looking at different tracers of dense interstellar gas. In collaboration with Yoshi Yonekura at Osaka Prefecture University and Yauo Fukui's NANTEN group at Nagoya University, we will be able for the first time to build a reliable picture of the typical evolution of these rare but powerful objects. CHaMP starts with a large area (20� by 6�) of the southern Milky Way in Carina and Vela. 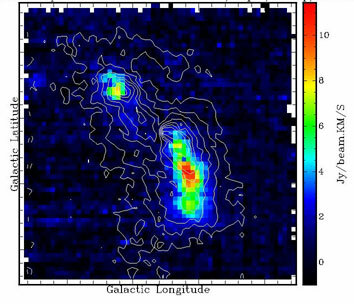 The NANTEN telescope has made complete, but low-resolution, maps of this area in a number of molecular lines, which trace the cold dense gas where stars are forming in our Galaxy. The carbon monoxide molecule in particular is a useful tracer: see figs 1 & 2. The Mopra dish near Coonabarabran (part of the Australia Telescope) is now mapping these cold, massive clouds at much higher resolution, and simultaneously in a number of molecular spectral lines. Looking at different molecules lets us understand the physical processes that dominate the star formation activity we see: see figs 3 & 4. Most significantly, since we are surveying a large number of clouds in the whole area in a uniform way, we will be able to look at the population of protostars, and derive lifetimes and other physical parameters that would not otherwise be possible. We are also using other telescopes around the world to complete this "big picture" view of massive star formation. With Stuart Ryder at the Anglo-Australian Telescope, we are imaging the young stellar clusters and the hot gas they produce, that are the end product of gravitational collapse in the molecular clouds. In Chile using the Atacama Submillimetre Telescope Experiment (ASTE), we will look at the temperature evolution of the cold gas as gravity compresses and heats the clumps that will become protostars. �High-Mass Cloud Cores in the eta Carinae Giant Molecular Cloud,� Y. Yonekura, S. Asayama, K. Kimura, H. Ogawa, Y. Kanai, N. Yamaguchi, P.J. Barnes, and Y. Fukui, ApJ, 634, 476-494, 2005. �CHaMPs of Star Formation: A Galactic Census of High- and Medium-mass Protostars,� P.J. Barnes, Y. Yonekura, A. Miller, M. M�hlegger, L. Agars, T. Wong, E.F. Ladd, N. Mizuno, and Y. Fukui, in IAU Symposium 231: Astrochemistry Throughout the Universe, D. Lis, G.A. Blake, E. Herbst (eds.) (Cambridge UP: Cambridge), 2006.